This Chocolate Sour Cream Bread is very moist, not too sweet and will satisfy your craving for chocolate cake! Double Chocolate Mayo Muffins are the best chocolate muffins, ever! At least according to my boys they are. Moist and chocolaty, they almost melt in your mouth! My oldest calls them Brownie Cupcakes. A huge thank you to our facebook friend, Jennifer W.. for sharing her mother's Banana Muffins recipe. (I adapted these Double Chocolate Mayo Muffins from the recipe.) Her mother added the delicious recipe, and others, to a cookbook for one of her birthdays. How sweet! Her mother also left room in the cookbook for her to add her own favorite recipes. I love it! 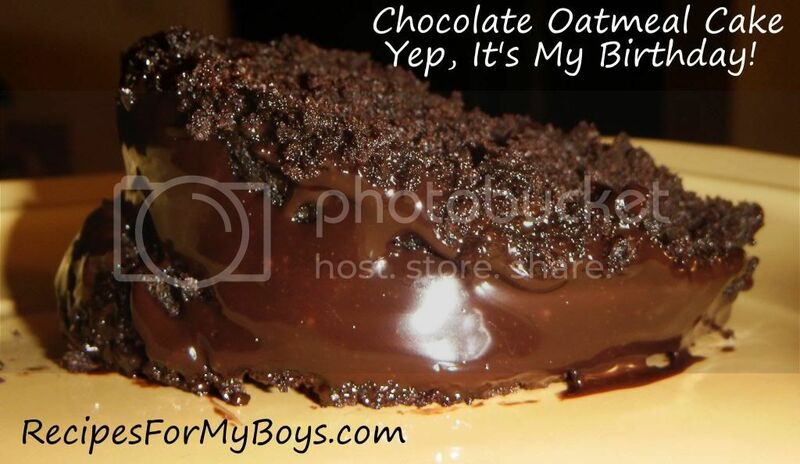 My blog is my cookbook to my boys. Sharing their favorites and some memories along the way. I made these for my son to share with his class for his birthday. They are very chocolaty and moist and a Hit! I adapted this recipe from an old clip I found for Baker’s One Bowl Brownies. I got an ice cream maker! Woo Hoo!!!! Finally! I made Vanilla Ice Cream for my first one...the boys LOVED it ... we all did! Do you like toppings on your ice cream? I'm picky about it and it all depends what type of dessert mood I'm in. Some days are berries while others are nuts and chocolate. Today, was chocolate so I decided to make Magic Shell. It's easy and everyone loved it. In less than one minute you can make magical chocolate shells and amaze your little ones, too. One of my twins stayed home from school today. When I asked what would make him feel better, he said brownies with white icing and sprinkles. make you feel all better! Love and hugs! These are so rich! You only need a bite...yet, you keep going back for more! Layer the toppings or mix them all together. However you top it, it is intensely full of deep, sweet flavors! My youngest just came home from the hospital last night after staying there 3 days from an asthma attack. The whole time there, he wanted brownies. 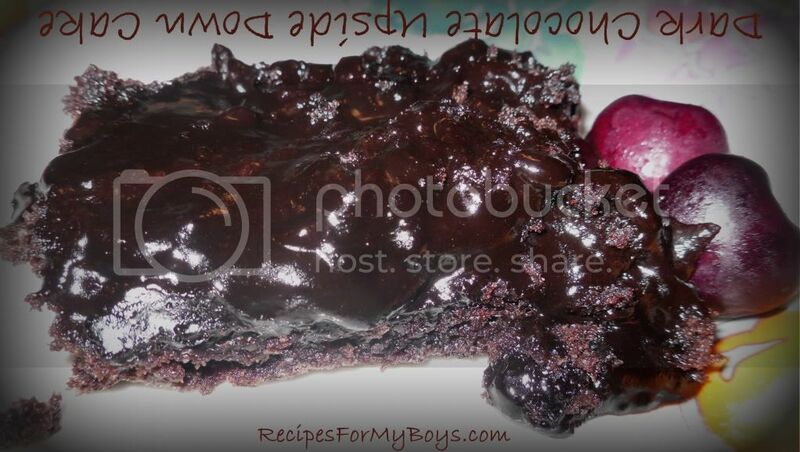 This morning, I made these really easy fudgy brownies for him. I know he will be happy to share with the rest of us. Enjoy them out of the oven while they are soft and gooey or let them cool and they are chewy outer covering and fudgy inside. Either way, I know you will love them! Use different flavor graham crackers, chips, dried fruit, nuts .... for a variety of new brownies. I am thinking quite a few ways to enjoy them! A frozen delight made from an old recipe. This is what happened the other day when I made it in the morning. I forgot a middle layer and left it in the freezer. YUM! What do you do when you don't have cream to make a ganache? You use what you have in the refrigerator, this for me meant sour cream. I love the way it tastes on my overpowering chocolate brownie and Frozen Banana Eclair Cake. This gets very thick as it cools so work fast. You can use a little more sour cream if you want it thinner, but not too much. You don't want a strong taste of the sour cream. I used Hershey's Dark Chocolate Special Blend and it turned out almost bittersweet. We loved it. Next time you are out of cream, grab the sour cream. While hubby was at the store this morning, I asked him to pick up german chocolate. It has been ages since I made anything with it and was feeling I needed to. Ya know? Do you get those hankerings that you have to do something…and now! That was me and I was so happy to see hubby home. I melted butter…having an idea, but not totally certain where I was going with this. The butter was melted, eggs and milk at room temperature, flour, sugar, baking powder, baking soda, salt, anything and everything I could think of, was ready. I picked up the german chocolate and it was opened! Not only opened but the paper was ripped off of it! I’m ready to bake and most important part of this, I don’t know recipe, is bad! Plan 2 ended up with Chocolate Covered Chocolate Baked Donuts. My boys will be so happy the german chocolate was a miss. ~smile~ I'll add more photos later. These are so light, melt in your mouth, not too sweet, deep, dark and chocolaty! If you like rich chocolate taste without being overly sweet...this is for you! Enjoy! Yep, it's my birthday. My 50th Birthday. One half of a century old. I have boys. A 9 1/2 year old and 5 1/2 year old twins. Hubby of 24 years. Beautiful friends. Some loving family. Dogs, cats, mini horses, big ole pigs and an old goat. I'm a Blessed and Happy Old Girl! Here is my birthday cake. I didn't want an overly sweet cake. This is dense, moist, rich and chocolaty. You may want to use regular cocoa and semi sweet chips if you want a sweeter cake. Love and hugs! I am always looking for new frozen desserts. It's summer and it's hot! Okay, we eat frozen goodness all year. 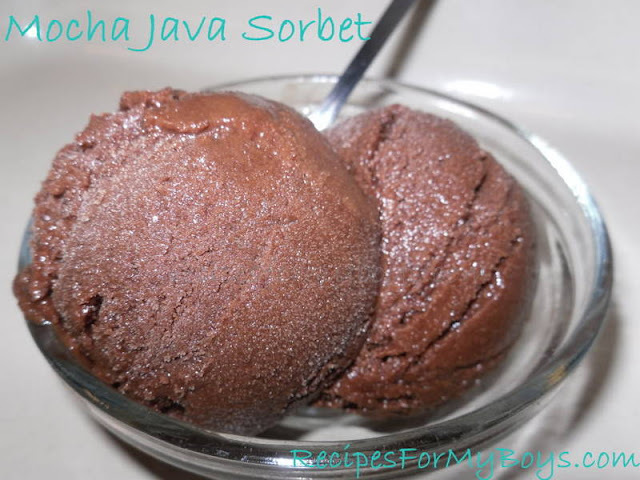 Anyway, I was looking for a different one and found many for mocha java sorbet. There are four of us that drink morning coffee. The younger ones are more coffee flavored milk. We like chocolate, too. Hmmm, something for us to definitely try! It turned out great! Except...seems there is an exception a lot these days, I didn't have semi sweet chocolate squares and used milk chocolate chips instead. Very chocolaty and yummy but the coffee is an aftertaste. Use semi sweet if you are looking for more of a coffee taste or replace the water with coffee or both, which is what I will do next time. Hope you enjoy it as much as we did. An old recipe my Grandma and Mama would make. It's also known as Chocolate Cobbler. Very simple yet wonderful. It's just what your chocolate lovers are wanting! A thin cake with a thick chocolate sauce. You can easily double this to make a thicker cake. When ready to serve, cut a piece, flip it over with a spatula and see the amazement on faces gathered 'round. As always in our house, nobody can agree on what kind dessert, or anything for that matter, they want. I did as I usually do and combine different ingredients of their requested food. It tends to make a happy dessert for everyone. 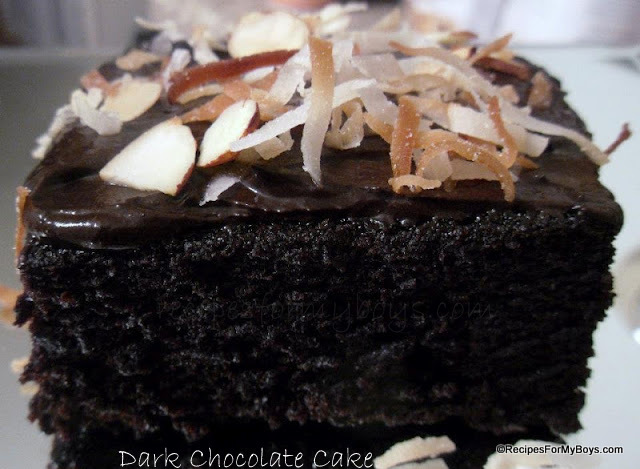 I saw a recipe on the back of Hershey's Dark Cocoa..here is their recipe for Deep Dark Cake. I adapted this recipe from theirs. This cake is very moist and really does not need anything to top it. The icing is great though. We added it to cut pieces, each person topping their own. I did find that this cake wasn't as thick as I wanted it so I made another cake that is reduced fat. It turned out a little thicker. I'll be sharing that one very soon. I am making another one tonight cake tonight in an 8x8" pan and will let you know how it turns out. <3 and hugs!